The Twin City Model Railroad Museum's world famous 3,000 square foot operating model railroad is now open in their new location just off University Avenue between both downtowns. The museum has one of the area's greatest collections of railroad art, a gift shop and roatating exhibits, including many local scenes, landmarks and famous trains from the 40s and 50s. The Museum includes layouts and exhibits from all toy train scales plus a "Thomas" wooden layout play area that enchants all kids that visit! Who’s the railroad enthusiast in your family? 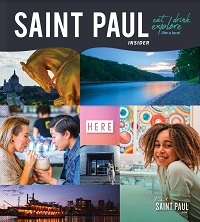 They’ll be fascinated by what they find in Saint Paul.